I spoke to Ido Ariel, Founder of Barilliance via Join.me, an online meeting platform today. 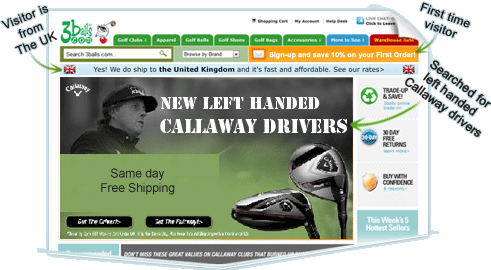 Barilliance offers a suite of marketing tools for e-commerce sites including cart recovery. The company is based in Israel, and was one of the first companies to offer cart recovery software, opening its doors in 2008. The company now works with around 250 websites in over 20 different countries. He tells me that Barilliance was the first company in the world to create a product which didn’t require a back-end integration. Barilliance differs from many of the other players in the cart recovery space, because they offer a range of marketing tools. Cart recovery is just one of their products. Barilliance is more rounded than some of the other cart recovery providers. Other companies are cart recovery pure-plays. Whereas Barilliance offer a whole range of marketing tools. “We feel the total value is much higher when you put all these tools together” says Ido. I think he’s right. I’m only looking at their software from a cart abandonment perspective, but the other tools do seem like they would add a lot of value. 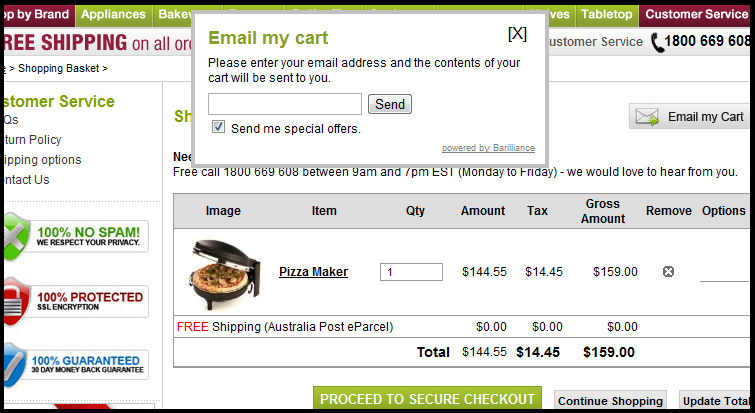 One differentiator that Barilliance have is the “Email my cart” pop-up. To recover more revenue, you need to capture more email addresses, and send more cart recovery emails. Barilliance’s pop-up, appears when a customer is about to leave the page or close the window. By grabbing back a customer’s attention, e-commerce sites can capture more email addresses and then make more sales. Ido told me that their clients had been very pleased with the results from this software. Self-service email design. WYSIWYG editor. A good feature around Barilliance’s cart recovery program is the self-service WYSIWYG (What you see is what you get) editor. This means you can edit your own email campaigns with too much hassle. It also has a function where you can put in your own HTML, and design your own emails. Big players in the market offer design as part of their packages. The advantage I see to something like Barilliance, is that if you already have those resources (maybe you employ an in-house designer or email marketer) you’re not paying for services which you don’t need. Ido told me that Barilliance answer nearly all their emails in under an hour, and often within a few minutes. That’s very handy to know if you have questions while using their software! That’s excellent customer support, if ever I saw it. All the pricing for Barilliance’s software is on this page. It’s great that it’s so transparent, you know what you’re going to pay before you buy the software. They also don’t tie you into a lengthy contract. You just pay month, by month. Many other companies in the cart recovery space, generally work on a CPA (Cost-Per-Acquisition) basis. Which is generally a negotiated percentage. It can vary greatly though. Barilliance integrates with Demandware, Magento and Netsuite, iContact as well as other Email Service Providers (ESPs). Barilliance have an excellent range of tools for e-commerce sites. They add value through not just through cart recovery, but with a whole suite of marketing tools. I see Barriance’s place in the cart recovery market as being mid-to-high-end. If you’re the one of the largest online retailers, you’ll probably want a full service cart recovery software from some of the larger players. Why? Because that would include account management, optimisation and design. They’d take care of everything for you. I would say that Barilliance is the most cost-effect method of shopping cart recovery if you have the right staff in-house or with your agency. If you have good designers and data-driven marketers, and are happy to manage your campaigns, it’s perfect for you.